How do we monitor actuals against what was planned? In layman's terms – decide what to do and then check that it is done. There are several really cool ways to do this and the above slide displays this perfectly. 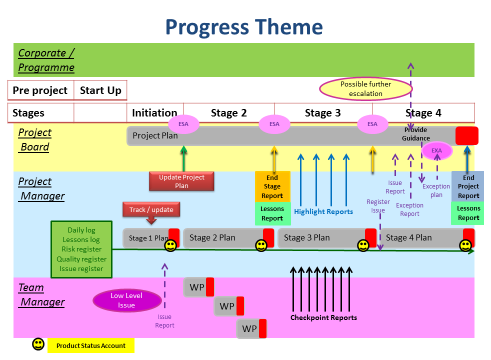 STAGES: the project is divided up into stages for review and decision-making opportunities. PLANS: units of work are created for the project stage and work package. TOLERANCES: these are controlled amounts of authority to create “space” for the various levels of management and enable the principle of “Management-by-Exception” to be applied. Time-driven reports: Checkpoint and Highlight reports are produced at agreed intervals – to monitor progress. Registers and Logs: these repositories of dynamically changing information assist in reviewing progress. End Stage and End Project reports (include Lessons Reports): these are important documents that assist in monitoring progress. Product Status Accounts: these reports confirm that products have succeeded quality reviews and are used minimally at the end of each stage and during the Closing a Project process. Issue and Exception processing: take place at a low management level (team and project manager) and at a ‘Stage and Project’ level – the latter could result in escalation (also the Corporate/Programme level).